Works by the American minimalist artist, famous for creating sculptural installations from commercially available fluorescent light fixtures. New York born Flavin was educated at Catholic schools and originally studied to become a priest. In the 1950s he left to join his twin brother, David, in the United States Air Force where he was trained as an air weather meteorological technician and studied art through the adult extension program of the University of Maryland in Korea. After returning home he continued to work on his artistic practice. Taking a job as a guard at the American Museum of Natural History in New York in 1961, Flavin started to make sketches for sculptures that incorporated electric lights. It resulted in his Icons series which featured eight coloured boxlike constructions made from various materials including wood, Formica and Masonite. One of these was dedicated to David, who died of polio in 1962. This began a theme in the artist's work, and his later pieces are also named after other artists and friends who inspired him. 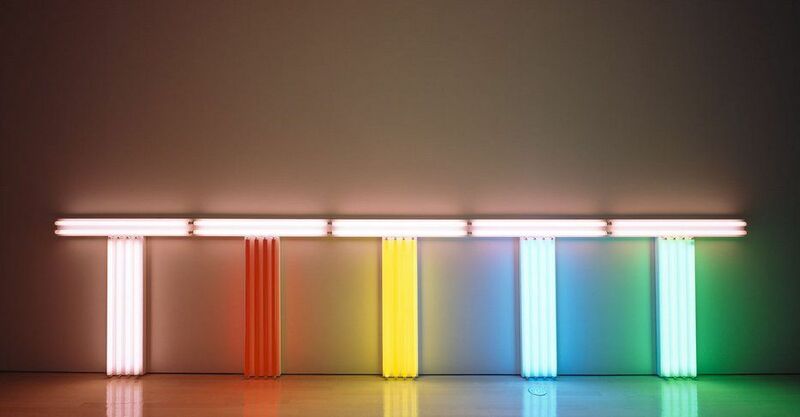 In the years that followed Flavin made a conscious decision to restrict his materials to commercially available fluorescent tubes and dedicated himself to working in series and serial arrangements. Interestingly, Flavin would wait for one of his installations to be sold before he actually made it so as to avoid unnecessary production and storage costs. As a result, when the artist died he left behind designs and drawings for more than 1,000 unrealised sculptures. This show forms part of Tate St Ive's biennial series of one-room displays by contemporary and historic artists. Each explores themes of materiality, minimalism, light and colour, drawing out related links to the gallery's architecture and surrounding location.